I don't know about you, but the idea of being buried alive is terrifying. It's not so much a problem these days, but in the past there were many stories about unfortunate people awaking in their own coffins. The history behind premature burial and preventions against it is incredibly fascinating. Once again, this topic was discussed in the book I'm currently reading, A Cabinet of Medical Curiosities by Jan Bondeson. Apparently, before the mid 18th century, the issue of premature burial was all but ignored. The opinion on death was that you either were alive or you were dead. There was no middle ground. If a person looked pale in the face, felt cold to the touch, didn't have a pulse and did not appear to be breathing, it was assumed they were dead. However, physicians began to publish accounts of terrifying tales of people being mistakenly proclaimed dead, bringing awareness to the matter. One such Parisian physician, Jean-Jacques Bruheir d'Ablaincourt, believed that if people read horrifying and memorable tales, the dangers of premature burial would circulate throughout the public knowledge. He was correct. For one, not all premature burials of the past were unintentional. Execution by burial was used in ancient China during the Warring States Period. Emperor Qin Shi Huangdi ordered 400-700 scholars buried alive after saving classics, which the Emperor had placed an imperial ban upon. After the emperor's death, Qin's armies lost in battle to warlord Xiang Yu, who ordered the 200,000 survivors buried alive. Although not exactly premature burial, Vestal Virgins that were suspected to have broken their celibate vows were walled up in an underground chamber. Vesta would save the virgins who were still pure and leave the tainted ones there to die. One of the most popular folk stories surrounding premature burial is the lady and the ring. This story has popped up in multiple versions in Germany, France, and Italy. The wife of a rich man dies and she is buried with a large gold ring upon her finger. During the night, one of the servants digs up her grave in order to steal the ring, however he is unable to pry the ring off. As he attempts to cut off her finger, the woman awakes with a scream. This one is probably my favourite. A young lecherous Frenchman is forced to become a monk by his religious parents. While he travels to the monastery, he goes into an inn. The innkeeper begs him to watch over his deceased daughter in order to determine whether or not she is truly dead. She is very beautiful and the monk, who cannot contain himself, has his way with the corpse. Once he leaves, the girl awakens. None months later, the monk visits the inn and surprised to see not only the daughter alive and well, but also a newborn child in her arms. He immediately tells her parents the truth and offers to leave the monastery in order to marry their daughter. Her parents gladly accept, even though their new rich son-in-law is a necrophile. There were some interesting "tests" conducted to determine that the deceased was actually dead. In Germany in 1670 (before premature burial was a public threat), Theodorus Kirchmayer and Christophorus Nottnagel advised that the funeral should take place several days after the death if there was any doubt. Most physicians claimed that absence of respiration and heart beat were not enough to base an assumption. Instead, only putrefaction and the presence of livid spots could establish death. When a person was suspected to be still alive, it was advised that the suspected deceased should not be treated as such; instead of lying in a coffin, they should lie in a warm bed and others should vigorously try to revive them. If the deceased did revive, the soles of the feet were cut with razors and poked with needles. Attempts of this manner did remain in practice very long. 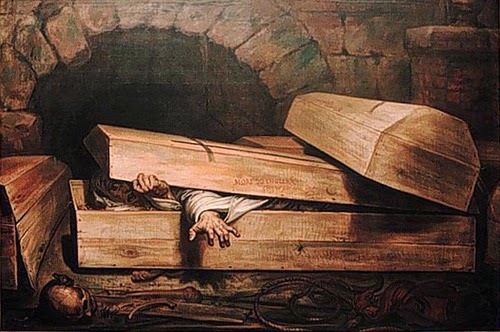 By the end of the 18th century, premature burial was the biggest fear of all. There were pamphlets, books, and articles everywhere all across Europe describing the horror. This led eventually to the creation of special coffins designed to combat premature burial during the 19th century. 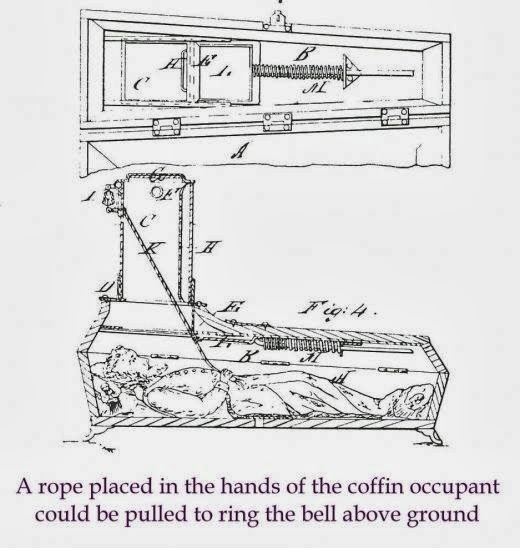 The most famous of safety coffins is the Bateson's Belfry, which had a bell mounted on the top of the coffin attached to a cord that was placed in the deceased's hand. Twenty-two safety coffins were patented in the United States alone between 1868-1925. The simplest of models had a hollow tube and rope ladder attached to the coffin. The top was a sliding door so that either the captive could climb out or others could easily check for signs of either life or death. Many later coffins were able to detected any slight movements from the individual inside. However, the detection devices were often too sensitive, picking up on the slightest movements associated with decomposition. One of these coffins was created by Count Michel de Karnice-Karniki, chamberlain to Tsar Nicholas of Russia. When the coffin registered movement, a tube on the top of the coffin would let in air, as well as flail around a white flag and emit a loud ringing. The gravediggers were none the least happy when the majority of coffins they dug up were filled with a half-decomposed corpse. The fear of premature burial has long been persistent throughout history and is present today even when the possibility of unintentional premature is negligible. Still, we find the theme of alive burial in popular culture, from classics like Poe's Fall of the House of Usher to modern day example, such as Kill Bill Volume 2 and The Girl Who Played With Fire. Chances are, people will continue to find the idea of being buried alive terrifying. I know I will.